According to a statement by the President's spokesman, Mr Femi Adesina, in Abuja, President Buhari gave the challenge in his keynote speech at the 2019 Annual Investment Meeting (AIM) in Dubai on Monday. The theme of the summit is: "Mapping the Future of Foreign Direct Investment: Enriching World Economies through Digital Globalisation." He also lamented over the steady rise in fake news and cybercrimes, particularly when platforms were hijacked and manipulated by criminals. "Today, we have a cyber-world that is intangible but real. This borderless world is powerful, and it impacts the lives of billions of people, no matter how remote their physical locations are. "People work in it. People socialise in it. And people invest in it. This presents enormous opportunities. But it also remains a constant threat if left unregulated. "On the one hand, it has made the human race more productive and more efficient. Today, we have digital banking, virtual currencies and many social platforms that connect people and cultures. "On the other hand, we have seen platforms hijacked and manipulated as evidenced by the steady rise in fake news and cybercrimes. 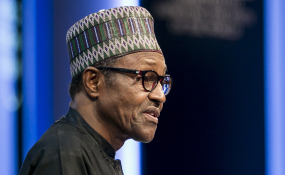 "More recently, we are also witnessing the use of the cyberspace to manipulate elections, subvert the democratic rights of citizens as well as propagate violence," Buhari told the ninth edition of AIM, attended by world leaders in both the public and private sectors. He, therefore, maintained that the challenge for world leaders must be to ensure that "this space is inclusive, accessible and safe". He said: "In Nigeria, our mobile phone penetration exceeds eighty per cent. This means the majority of Nigeria's one hundred and ninety million citizens are fully connected to this new digital world; especially our youth. "Sixty-five per cent or one hundred and seventeen million Nigerians are under the age of 25 years. These bright minds are the drivers of this emerging digital sector. "Today, Nigeria has close to ninety technology hubs and every day, new ones are coming up and they are all developing solutions for Nigerian, and indeed global problems. "Already, these young entrepreneurs have attracted investments of over one hundred million dollars. A sizeable amount from overseas including Silicon Valley. "As many of you from this region are aware, Nigerian start-ups always have a very impressive outing at the Gulf Information Technology Exhibition (GITEX). Many have won prizes." "When we came in 2015, we immediately agreed that any future economic growth must be inclusive. As the Nigerian youth population is fully digitalised, it is clear that the idea of having an inclusive economy cannot be achieved without digital inclusion." The President announced that Nigeria was working on creating the largest digital database in Africa, with over 30 million Nigerians and legal residents already captured in the country's digital identity system. Also, the President highlighted that Nigeria's public sector reform programmes, from procurement to payroll to revenue collections, focused on digitising key operations. He said the recourse to technology and digitisation had reinforced the administration's objectives of improving efficiency, accountability and transparency in governance.